This And That (About The Word of God): You Can Have The World, I'll Take Jesus! You Can Have The World, I'll Take Jesus! If you obey my commandments, you will remain in my love, just as I have obeyed my Father's commandments and remain in his love. I have told you these things so that my joy may be in you, and your joy may be complete. Only by seeing beyond ourselves and our cares can we possess Godly joy or gladness of heart. Joy is a quality of gladness, delight, and jubilance. The spiritual fruit of joy and the emotion of happiness are not the same. Each springs from a different source. Happiness comes from the world around you and is dependent upon your circumstances; it's emotional. Joy originates with the Spirit of God and is not dependent upon outward circumstances. It is God's desire that you have joy . . . The believer's source of joy is not in worldly things but in God. Because your joy is spiritual and not dependent on outward circumstances you can rejoice in temptation. You are to be longsuffering with joy. 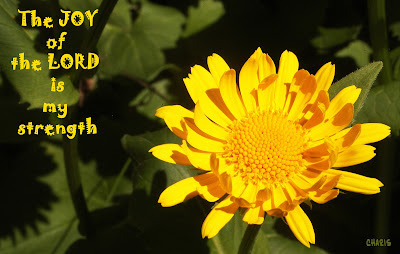 . .
Joy is part of the Kingdom of God . . . The Bible encourages believers to be joyful and express this joy unto the Lord. Just as we do not sorrow as the world sorrows, our joy is not characteristic of worldly joy. Carnal joy is temporary because it is based in self-centeredness. By the lifestyles of the average, unconverted person, we can easily see that they live their lives up and down dependent upon their current situation. But God tells His people not to rejoice like the world. In their up moments, pride and arrogance prevail. It is better to have sorrow in humility than joy in pride. The ancient Israelites expressed joy by singing, dancing, playing musical instruments and shouting at victory celebrations, festivals, sacrifices and coronations. Gladness and joy are blessings from God. Gladness is the experience of pleasure, joy, or delight, resulting from happiness and joy. grounded upon God Himself and derived from Him. It should characterize our lives as Christians. The term "morning stars" is a biblical term for angels who express joy when events in God's plan unfold. Not only God but also angels are thrilled when a sinner repents of his worldly ways. Prayer for forgiveness brings about joyous repentance and restoration of righteousness in a person's life. There is joy in heaven. This world and everything in it is temporal. Our emotions based on these temporal things are fleeting. The joy of the Lord is everlasting both in this world and in eternity with Him!